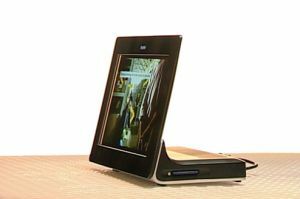 KODAK OLED Wireless Frame is a digital picture frame with a 7.6" AMOLED that offers built-in Wi-Fi technology to access photos. You can use the frame's internal 2GB storage to store photos (via USB or memory cards), or indeed use the wireless network to access photos on your computer. The picture frame was available now from amazon, for 795$, but they are now out of stock.